Dynamic tactile displays represent a class of haptic devices of particular interest to the blind and visually impaired. Despite many years of research and development efforts, the low-cost, low-power, compact tactile display remains elusive. This paper describes a low-cost electromechanical actuator array based on low-force, low-displacement bistable actuators that can be realized using inexpensive, commercially available components and high-volume manufacturing processes. 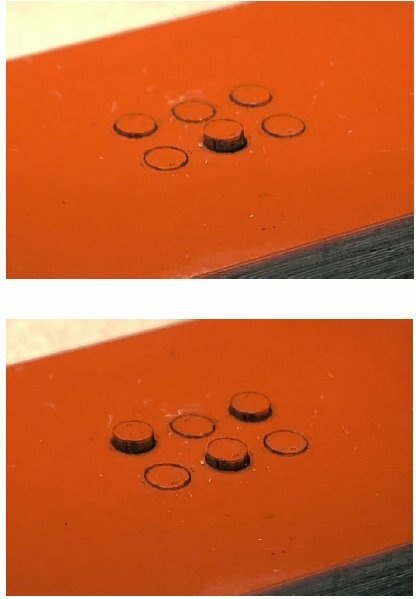 The array is applicable to several types of tactile displays; as an initial proof of concept, we demonstrate a 6-dot Braille cell with a 3mm pitch that requires less than 50mJ per actuator per transition.